The Solo 750 is a classic six-wheeled amphibious vehicle, of which only 96 were ever built. One of those went to Beuerberg in 1980, where a Swiss lawyer was thinking of creating a golf course. He had a seven-figure quote from Jack Nicklaus and a five-figure offer from Dieter Sziedat, but entertained the rather frugal four-figure design fee of Donald Harradine. Naturally, to develop a routing, the architect had to get around the site and since that was basically a 300-acre swamp, the Solo 750 was thought to have a job. However, the intrepid Scot ended up trusting his Wellingtons more and after four days of treading water came back with the layout that is still in use today. Harradine also led construction and was able to build to fairly high standards, so there's more installed drainage than at nearby St Eurach and the course plays better for it. These days the club is also renowned for its association with local celebrities and especially the gourmet restaurant (St Eurach, with no mean kitchen themselves, once tried to poach the Beuerberg chef). The course itself seems almost a secondary consideration at times, but it’s actually quite good. Harradine often goes for additional par fives and he managed to get five in here as well at the expense of a one-shotter. So the par is 74 and the soft turf doesn't give any of the 6,850 yards up easily. 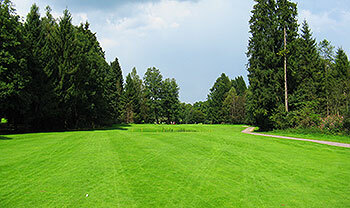 Fortunately, there still was room for a couple of short par fours that are much loved by traditionalists and these are played as the 270-yard 5th and 315-yard 10th holes. The other hole designs are also quite solid, there is good variation and an appropriate supply of man-made features. Despite the length, there aren't any huge forced carries, so shorter hitters should be ok, while average hitters will be challenged by the ditches crossing a few of the fairways right in their typical landing zones. One unexpected surprise for such a mature course is that, while trees do come into play in some spots, it always makes strategic sense and the player rarely feels restricted. Finally, at the end of each 9-hole loop a huge double green lies in wait. Its sole greenside bunker defends both pins and often sees simultaneous action from players approaching #9 and #18. So this well-balanced layout, while not Hall of Fame material, should create fun and challenges for everyone, provided it is given a dry spell of a few days. The Solo 750, by the way, was not only shunned by Donald Harradine, but a commercial failure altogether and the manufacturer never built another ATV. Instead, the owner of the Solo company sent his son to film school and the lad by the name of Roland Emmerich turned into a famous director of Hollywood blockbusters. So there's a win for everyone in the Beuerberg story and yours is, if you catch it in nice weather, the backdrop of the Bavarian and Austrian Alps is nothing short of spectacular. This used to be Germany's No. 1 ranked course in the 1990s, when a member of the club was heading the rankings panel of various Golf magazines. The well-connected owner always made sure to have enough opinion leaders and celebrities amongst the membership by providing first rate services and top greenkeeping. When everyone got older he even succumbed to getting the cart fleet he previously shunned for health reasons. So there is no shortage of effort, but also no denying the fact that the course was built in a veritable bog, which certainly make s for some beautiful vegetation, but also poses challenges for even the best of drainage systems. A few holes in the middle of the back 9 are still surrounded by some of the pure marshes that once covered the entire property - a most unusual and stunning sight. You would not normally get permission to build a golf course in protected wetlands like that. Be that as it may, this terrain makes Beuerberg a tough place for scoring. Due to the lack of roll it plays very long except in the driest conditions, when some fairways will actually split open. The site is big enough for 36 holes, so the existing 18 spread out very generously, but for some reason two longer green-to-tee walks were not eliminated. Other than that it is a very harmonious routing with gentle undulations and very easy to navigate. To me it was fun to play, most holes have some kind of twist and the decently paced greens are pretty true, if not terribly interesting. The par 3s should probably be freed from some vegetation, though.